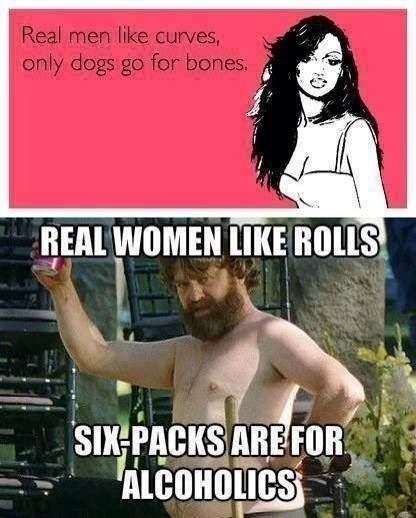 All the ladies out there talking about how “real” men want “real” women, shut up. For real. This debate is a Cosmo version of the presidential debates. No one believes you when you are talking unless you are indoctrinated into the Kate Moss or, conversely, the Velvet D’amour camp. Because if people were really, truly honest they would be able to admit there’s a whole spectrum of body types out there with no single type being more “real” than the other. Women uselessly attack each other over their appearance. We use a special language when referring to our bodies that lets others know what camp we reside in. “She’s a curvy girl.” “She’s a fit girl.” “She’s bony, ew.” “She’s a ‘fat piggie’.” That last one was a description of Kate Upton that’s floating around the interweb. We are so afraid to admit that bit in the mirror is a roll vs a curve. We are terrified to say that maybe this weight results in a gaunt looking face. It’s okay to be flawed, ladies. Even the models, both conventional and plus, are flawed. They just have airbrush and a team of professionals. We have to stop using language in an attempt to hide those flaws. No more “real” woman when you mean chicks size ten and up. No more “healthy” woman when you mean size four or below. We all have our assets, but they are not made greater by renaming our flaws. They are not made greater by renaming the flaws of others. Accept the lack of perfection, call your roll a roll, then call it a day. Then you don’t have to be so mad at the woman who doesn’t have one, because she’s admitting to not being perfect either. See how that works?